I am slowly catching up on sketches from last week! My intent was to try to combine this one with another, but I wasn't able to do that this time. This one is for Jen's Sketch for You to Try from 111508. I had this sheet of patterned paper that was perfect as it already had circular images, so all I did was punch out circles, and mount them on larger scalloped circles. I added chunky glitter for snow at the bottom. 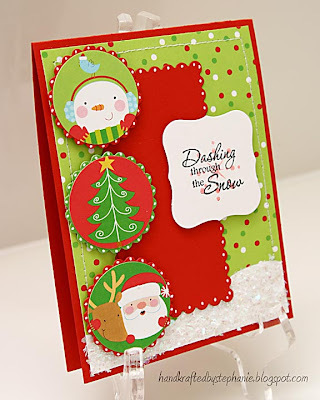 This is a simple card that I may duplicate and create a few for my Christmas stash. Cardstock: PTI; Patterned paper: MAMBI; Stamps: Verve; Ink: CTMH, Memento Tuxedo Black; Nestabilities long rectangle, circle, labels 1; Martha Stewart mica flake glitter; Other: white gel pen, thread, foam tape. Oh, how cute! Such a darling card!